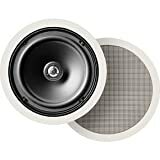 Amazon has the definitive technology UIW83/A Round In-ceiling speakers (pair, white) for $210 with free shipping. Sells for $478+ Highest Price. Deals for $179 Lowest Price. Normally $353+.